In a profession like mine where every appointment needs to be at least 45 minute but never greater than 60 you quickly learn to never leave your watch at home. These days watches seem to loosing out to cell phones for time keeping across the younger demographics. But what makes a watch special? Could it be the tech inside of it? The person who gave it to you? The meaning of it as a gift? For me a watch is the perfect accessory to lift your spirits boost your outfit. My favorite style are the leather strap watches. What can I say, I love classic pieces that I can wear forever and goes well with every of outfit. Jacqueline Kennedy was notoriously know for wearing a black leather strap watch. 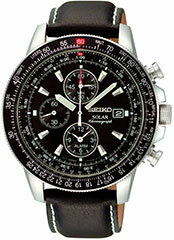 The leather strap Seiko watches at BlueDial.com are quite fabulous. One of my favorite is the Seiko SXGN42. This one is basically a carbon copy of the Jackie O watch. Blue Dial have some of the best top name brand watches at the lowest prices. Plus they have FREE 2 day shipping available so you can get your watch quick and on time for the holidays! They have some of the coolest watches that I have personally seen. Their web site is easy to use and well organized to help you find your perfect watch. When you're ready to order they have several options available for ordering and payment to make everything fast and convenient for you as well. Check out the watches Blue Dial has to offer. I would love to know which ones are your favorite! Feel free to share your experience or favorite piece of their collection in a comment below! Disclaimer: This is a sponsored post written by me on behalf of Blue Dial. All opinions are 100% mine.